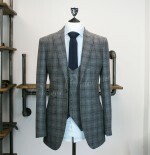 Here at Victor Valentine we specialise in tailoring full made to measure suits. Each suit is individually crafted and every aspect can be customised to ensure you create a completely unique suit. 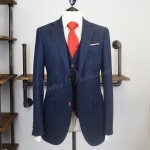 Fabric, lapel style, waistcoat style, jacket design, lining, buttons and button hole stitching along with many other options are all decided by you. Accept nothing less. Tweed is a fantastic look for that more rustic wedding. It offers a quintessential British style that is second to none. We offer a vast range of fabrics to ensure that you can find the exact look to complement and enhance your occasion. From the more country 3 piece tweed suit styles in traditional browns and greens right through to more modern look based on blues and greys. We can create ANY style that you require. 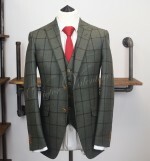 Take a browse around our online store and see the vast option of tweed suits that we have to offer! ‘You get what you pay for’ is never a more true statement than when purchasing THAT suit for your special occasion. Why would you settle for cheap ‘plastic’ tweed from the Far East on a suit most probably made by children (sad but true). Weddings are expensive and we understand that everybody has a budget but they are also THE most important day of your life (to date). Spending £100-£175 on a ‘tweed’ suit will get you exactly what you’d expect. A shinny polyester blend fabric made to a ‘mass produced’ quality. You simply can’t purchase quality wool and tailor a suit for that price. Our fabric alone costs us close to £200. 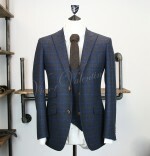 Purchase online from Victor Valentine with the confidence that we specialise in tailoring high quality suits. Alternatively, come visit us at our showroom where we’d be delighted to show you up close and personal the quality of our suits and run through the many cloth and options that will make your suit truly one of a kind. awesome suit, just damn awesome. Already ordered another! Can’t recommend these guys highly enough. Great suit, great price. Received the tweed suit & just wanted to say a huge thankyou. It fits beautifully. Once again thank you. Suit has arrived. Fits Perfectly! Pleasure doing business with you. I was lucky enough to get hold of an early release 3 piece tweed suit. One word. Stunning! The fit and quality is absolutely amazing.